Since the election, Immigration and Customs Enforcement (ICE) has substantially increased the number of immigrants it targets in New York State Courts. 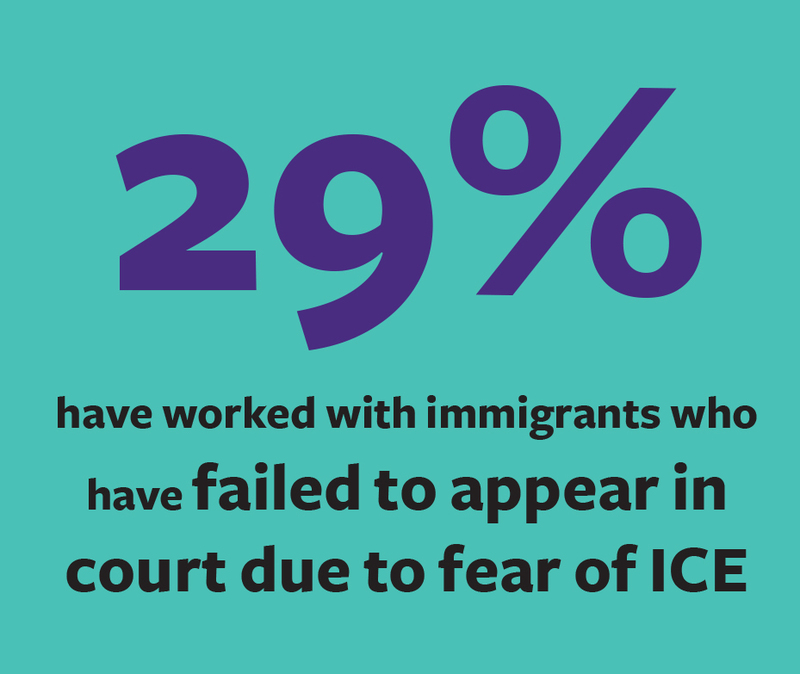 For more information, visit our Ice out of the Courts campaign. As a result, many advocates are hearing from immigrants that they have a profound fear of going to court. This includes immigrants who need access to the courts for orders of protection, to defend against criminal charges, and to vindicate their rights as tenants. To better understand these concerns, a coalition of legal services and community based organizations sent out a survey to the field from June 12 – 23. 225 advocates and attorneys from 31 counties across New York State participated. The participants work in criminal, family, housing, employment, education, and immigration law, and practice in criminal, family, and civil courts in New York State. 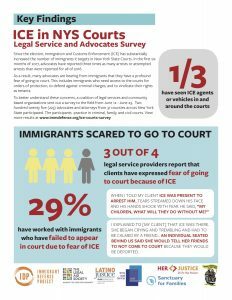 A third of respondents reported seeing ICE agents and/or ICE vehicles in and around the courts where they practice in New York State. Respondents have been seen ICE in all five boroughs of NYC; Suffolk; Nassau; Westchester; Columbia; Dutchess, and Putnam. A third of the survey participants work with survivors of violence. A sixth of the respondents work with tenants in Housing Court.